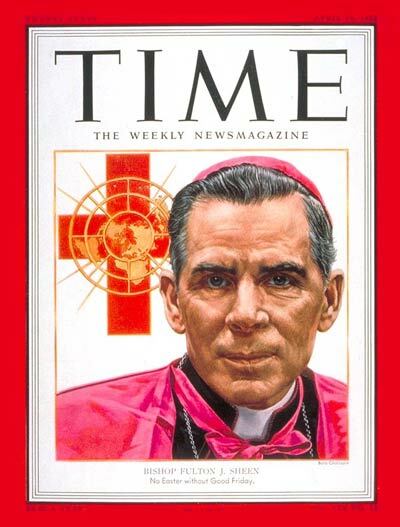 Fulton J. Sheen Society Inc.
One can only imagine what the impact that the recently unexplained medical phenomena if approved by the Vatican as attributed to the intercession of Archbishop Fulton J Sheen will have on America and as a consequence on the whole world. I know with my involvement in the work of the Society the influence that this man’s life and works are having here in Australia and in other places is immense; and we are only seeing what is touching the edges. I have always believed that Fulton J. Sheen will be recognized as one of the greatest influences the Church has had since Apostolic days; this is due in part to the advantages he had of most of the modern means of communication, but more so because of his Christ-like-ness in all he said and did. Daniel and Martin Tobin commenced the formation of the Society in January 1999 and became an incorporated body in August 2000. Yolanda Nardizzi has subsequently become a founding member. All three founders are still actively involved in the Society. "God can draw good out of evil because, while the power of doing evil is ours, the effects of our evil deeds are outside our control and therefore in the hands of God." "A Servant Of All" The film about Archbishop Sheen. A Fulton J Sheen appreciation blog.